0-minute walk from Exit 1C of Roppongi Station on the Tokyo Metro Hibiya line (direct link to concourse). 4-minute walk from Exit 3 of Roppongi Station on the Toei Subway Oedo line. 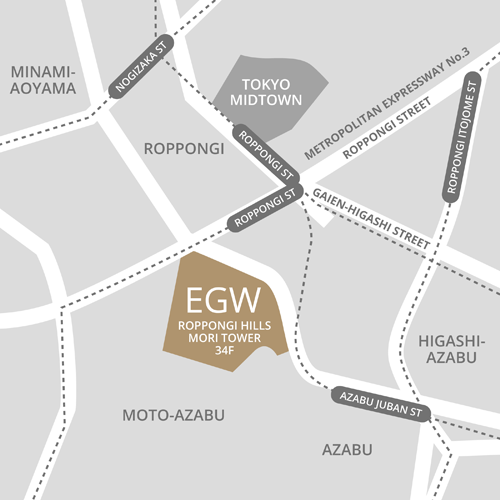 5-minute walk from Exit 7 of Azabu-Juban Station on the Toei Subway Oedo line. 8-minute walk from Exit 4 of Azabu-Juban Station on the Tokyo Metro Namboku line. 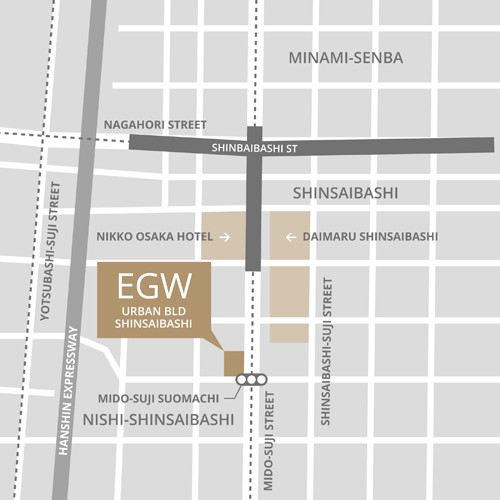 3-minute walk from Exit 7 of Shinsaibashi Station on the Midosuji-line / Nagahori-tsurumi-ryokuchi line. For more information, please contact us on +81 3 5771 3939, email info@egwam.com or use the contact form below. © Copyright EGW Asset Management Inc.